An unexpected wet start to the day, the BBC weather app hadn’t mentioned rain! So it was on with the layers to keep dry as we pushed off to gradually climb up the River Soar. Heading out of Zouch you pass a lot of small river huts. 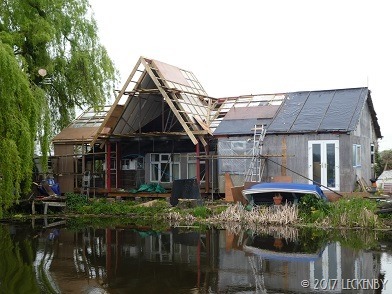 These are the river equivalent to beach huts at the seaside, only they tend to be that bit bigger and built on stilts for when the river floods. 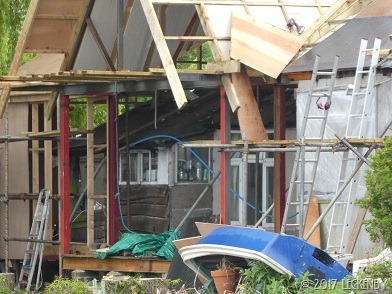 One such hut was being turned into the Russian Doll version with a larger hut being built over and around it, how many more huts were there inside? Bishop Meadow Lock was the first of the day on the outskirts of Loughborough. Once up we decided to top up the water tank so pulled over. This tap was slow, not helped by it having a very big leak before it reached the hose connector, so most of what water there was was being sprayed onto the freshly cut grass. 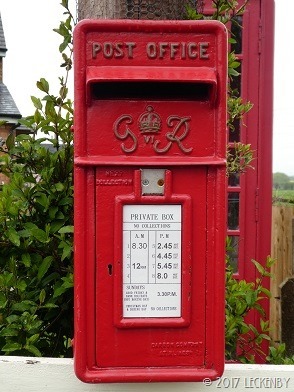 A C&RT chap filled his kettle from the leak as we tried to fill our tank. Before we gave up we noticed a number checker walk by, is this the first sighting since Oleanna has been licenced? We decided to see if the next tap was going to be any better. This is on the side of a pub and as we pulled up Mick had to move on a mum and her offspring who looked like they had settled for the day. This tap was only slightly better so we decided to have lunch as the tank filled. 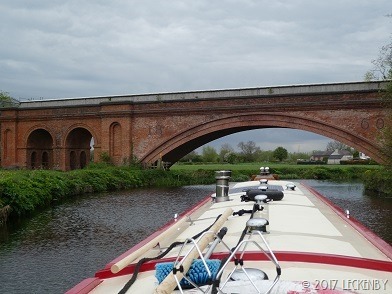 There is a long stretch before passing through Pillings Flood Lock and arriving at Barrow-on-Soar. Here there is another deep lock. As we pulled up a wide beam was just finishing coming down so we saved them shutting the gates. 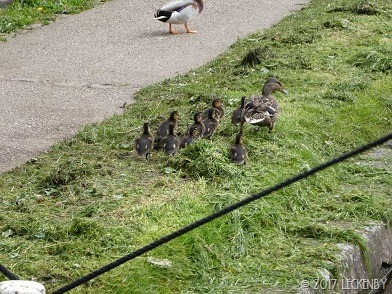 We were being followed by some canoeists who pulled their boats out of the water and walked them up to above the lock. 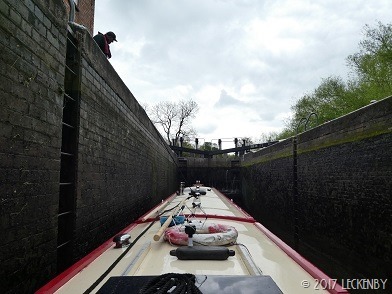 By the time we had filled the lock they were putting their boats back into the water just as the gates opened. 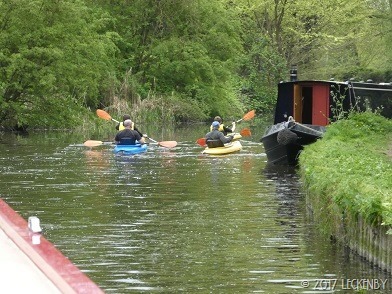 Canoeists are normally faster than narrowboats as they don’t have to abide by any speed limits, so we expected these four to zoom off into the distance, but no they slowly paddled their way along chatting, certainly not aware of 20 tonnes or so of boat behind them! Luckily they pulled in soon back where they’d hired them. Now the river seems to get narrower and there are more bends. 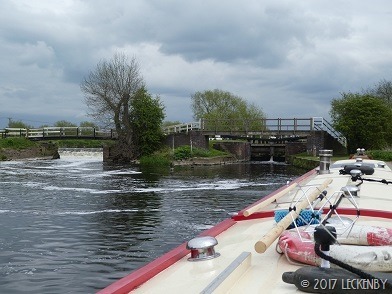 At times it is hard to know which way the navigation is turning and boats moored off on side channels just confuse you. But looking behind us we could tell we were heading the right way as that view was familiar. 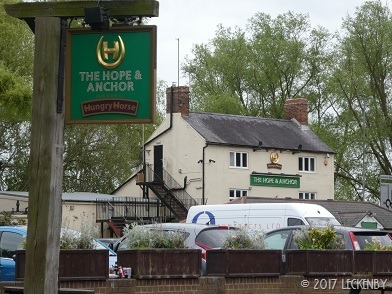 A short distance on we passed The Hope and Anchor. We’ve been this way twice before and both times were in June. 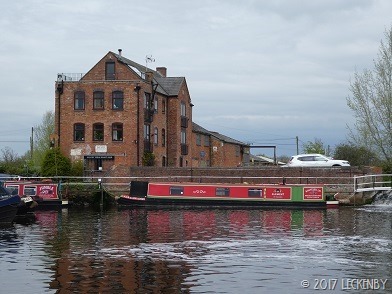 At that time of year the Hawthorne blossom has just gone past it’s best and is fluttering down into the canal. The water is white and the air filled with snowing petals. Today we had a smaller version of the snow shower, maybe the cut here has trees that blossom all year round so that the air is continuously filled with petals. Not far now to reach todays destination, just one more lock. 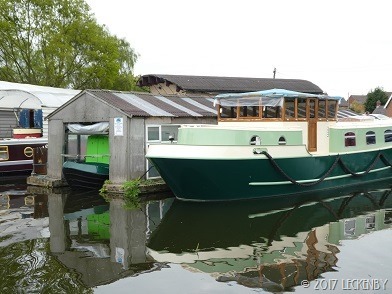 Two boats were being worked on at the MGM boat builders, both various shades of green. People think that Lillian is bright but I think the bright green upstages her Rapeseed yellow. 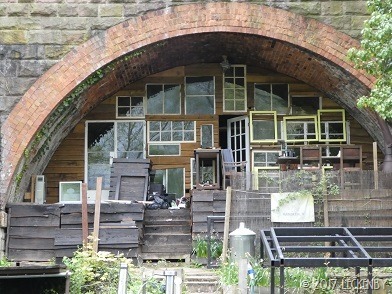 A few more bends on the narrow river and then the bollards of the moorings at Birstall came into view. They have always been full before, but there was space for two more boats. Our first attempt at mooring was thwarted by lumps under the water. The stern of Oleanna was at least four foot out from the edge so we moved up to try further up and succeeded. 8 locks, 14,84 miles, 1 flood lock, 1 left, 1 kettle, 2 water points, 8 babies moved on, 1 bucket of flowers, 2 boats in Amsterdam, 1 calm river, 2nd attempt, 2 Crick moorings sorted, 1 canal Narnia, 1 chocolate deprived boy! This is a dual post with NB Oleanna’s Blog. In a few days time our cruising blog will only be posted on NB Oleanna’s blog and NB Lillyanne’s blog will only be updated when something significant happens. So if you would like to continue to follow our travels please click to follow Oleanna. This entry was posted in Uncategorized on 20th Apr 2017 by pipandmick.